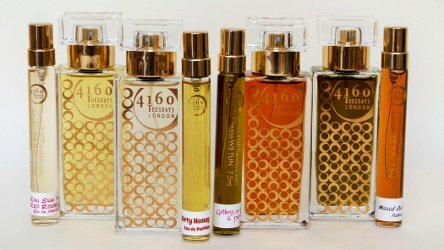 Indie brand 4160Tuesdays has launched Crimes of Passion, a new collection of seven fragrances: Inevitable Crimes of Passion; Dirty Honey; Maxed Out; Raw Silk and Red Roses; Midnight in the Palace Garden; Goddess of Love and Perfume; and Be Careful What You Wish For. Inevitable Crimes of Passion ~ "The original fragrance which started the whole project, Inevitable Crimes of Passion is a rich, deep scent that tells a story. It reminds Sarah of a Henry James novel, with an innocent start that makes promises of love, but becomes complicated - passionate, intense and compulsive - and can't ever return to simplicity. She deepened it with mushroom absolute (boletus, the cep or penny bun) to give it a dark, sensual, animalic base." With orange, pink pepper, cognac, sandalwood, cedar, mushroom, chocolate, coffee and musk. Dirty Honey ~ "Along Sarah’s street there was a sudden spring blossoming of Mexican mock orange, tiny white flowers that wafted their delightful scent through suburbia for two weeks. Mock orange and Sarah have history; when she was two years old she shoved the buds from her garden shrub so far up her nose to get more of the smell, that she had to go to the doctor's to get them extracted. It was fate. Now that she knows a bit more about perfume, the blossom smells to her just like dirty honey, so she made herself a version to last all year round. It's a white flower fragrance, made with beeswax and honey absolutes, woods, vanillin and labdanum, jasmine and honeybush extract." Additional notes include Atlas cedarwood, frangipani and musk. Maxed Out ~ "There's a 'fume fan’ who's a fragrance friend of Sarah’s, Maximilian Heusler. She and Max got talking online about his ideal fragrance and it was the most amazing idea, inspired by his former wild times...He told her about the kind of night out in New York that involves cocktails, marijuana cigars, hookers and passing out. She knew what cocktails smell like; the rest? Sarah has a good imagination. So this is one intense scent: rum, coconut and lime, tobacco, coffee and cannabis essential oil, a handful of vintage style musks, a generous dash of vanilla, a drop of cumin and woods. Max was astonished with the result; it’s exactly the smell of his Ferragamo leather jacket from 2003." Raw Silk and Red Roses ~ "Sarah wanted to make a really rosy rose, a 1980s style scent, like a walk through a rose garden. She loves her rose fragrances, and although she had been dabbling with rose and violet, rose and herbs and rose and vetivert, she'd wanted to take the plunge with pure rose. Her aim was "Wow! Roses!" but bearing in mind that perfume fans like to know what other notes there are surrounding the rosy heart, you may also detect a handful of flowers, fruits and resins." Additional note include peach, yuzu, woods, geranium, opoponax, musk and patchouli. Midnight in the Palace Garden ~ "Picture a hot night in an Eastern palace, the moon shines into the courtyard, where a fountain gently plays. Jasmine, orange blossom and frangipani scent the air. A cedar tree grows in the corner, there's a silver tray with strong coffee, fresh blood orange juice and vanilla sweets. There's a divan covered in silk and cashmere shawls to rest on and stare at the stars....As extravagant scents go, this is one of 4160 Tuesdays’ most outrageous: three kinds of cedarwood, sandalwood, coffee, vanilla, blood orange, davana - an artemesia which smells like mulled wine - jasmine, neroli and frangipani." Goddess of Love and Perfume ~ "Aphrodite (Venus in Roman Mythology) was the goddess of love and perfume, also of pleasure and beauty. Sarah wanted to make the ultimate fruity chypre, with backcurrant, peach and her favourite raspberry leaf, and sufficiently heavenly for Aphrodite...Sarah was particularly impressed by two fruity chypre fragrances which she smelled at the Osmotheque in Versailles - Fruits Defendus from the 1920s by Paul Poiret, and Shocking by Schiaparelli from the 1930s. She wasn't even sure if it would be possible to make something that gorgeous and legal these days.[...] This is Sarah’s own favourite perfume." With plum, peach, raspberry, bergamot, yuzu, blackcurrant, wild strawberry, rose, jasmine, lily of the valley, vanilla, oakmoss, opoponax, patchouli, oakmoss and vintage musks. Be Careful What You Wish For ~ "Sarah had decided not to make an oudh fragrance, mostly because they so often seem to be brought out merely to grab a cynical share of the lucrative Arabian perfume market....Recently she was in Dubai, and bought five different oudhs from the soukh at the creek and decided to change her mind. It's different from most though - a citrus fruit oudh with guaicwood and patchouli, plus a new wood oil which is being called white oudh by the French supplier; it's from a tree that grows in Indonesian mangrove swamps. Five oudhs give it a deep, animalic woody feel, but it's not got the overwhelming typical smell of decaying woods. There's not much point making an oudh scent that smells like everyone else's though, is there? So a fresh fruity oudh, that's what we have here." With pink grapefruit, juniper berry, peach, white oudh, raspberry, strawberry, guaicwood, patchouli, vanilla, plum, dark oudhs. 4160Tuesdays Crimes of Passion fragrances are available in Eau de Parfum or Extrait, in a variety of sizes. these all sound good to me in one way or another. Where do you get them from? Roullier White in Dulwich, London are stockists. Rose and Goddess intrigued me enuf to put samples in “my cart” at Luckyscent. I’ll see how I feel later in the day before I hit PAY. Those were the two that appealed to me as well. Thank you, I did not even know these were already there. Shame on me, and I was just admiring their new site design yesterday. Who’s Sarah? I don’t know her. I must agree – Maxed Out is fabulous; I like it very much and wish I could have gone on one of the outrageous nights out that inspired it. I’m also very keen on Crimes of Passion and Midnight in the Palace Garden.